The consistent maintenance of car makes it operate efficiently. Running a car can be an expensive affair for many. But by getting car serviced regularly from a qualified team like Pitcrew car service in Gurgaon and Delhi, one can keep their vehicle in a good working condition. Timely car service and maintenance helps save expensive future breakdown scenarios. Cars these days have become extremely complicated with numerous electrical and electronic features which can only be handled by a well-trained car mechanic. Diagnosing problems require sophisticated tools to read sensors and electrical readings. Workshops like Pitcrew car service in Gurgaon and Delhi have tools available which can help is swift diagnosis of the problem. Many a times there are cases where symptoms are non-existent, but regular car service helps in quick identification of future issues which if highlighted by the car mechanic make the customer aware of the potential problems that may arise in future. Any kind of car services can be booked within one car service shop like Pitcrew. Services like car repair, car wash, denting and painting, dry cleaning and car service & maintenance all are covered under one roof. With Pitcrew app (www.pitcrew.co.in/app) services can be booked before hand from home or office itself. Regular Car Service helps in increasing a car’s life expectancy. Many people prefer to buy a second-hand car after checking whether it has been maintained by the car owner or not. 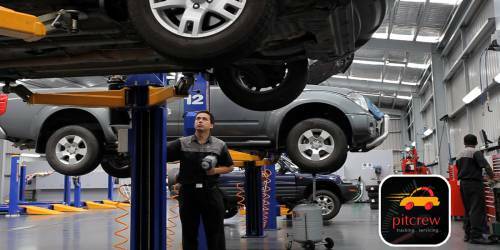 Thus, if you opt for routine maintenance and service of your car you can sell your car easily and at a good price too. Well maintained car is bound to give less problems over time. A frequently serviced vehicle has lesser odds of causing road accidents than one that is certainly not serviced. Inability to service your vehicle can not just endanger your security but can also put lives in danger of other people on the road. You must get your car serviced routinely to save yourself and others from such dangerous situations. A well maintained vehicle has a less likelihood of breakdown. Everyone knows the hassle of an unexpected breakdown. It can still be managed if someone is at the convenience of home or office, but a breakdown at a remote unknown place is a big setback and results in complete loss of peace. I like that you mention how regular car service will increase the efficiency of your car. My brother is looking buy a car and wants to keep it running well. I’ll be sure to talk to him about finding a professional auto shop to help. i had got best service in gurgaon. thanks a lot for this service. I am interested in finding a car service to bring my vehicle in and get it fixed. It is nice to know that there are so many other benefits to going into these services. I would love to have increased efficiency in my automobile. i got the best services from Gurgaon car services. i was totally satisfied after looking my car. thanks a lot. I like how you said that a car service can help increase the life of your vehicle. We have a car that we bought about 10 years ago that has started to run a little bit poorly. It would be really nice to keep it running so we’ll have to look into taking it to get serviced somewhere. I really like how you talked about a frequently serviced vehicle having lesser odds of causing road accidents. I want to get a new car and have been pondering how I will maintain and have it serviced before I buy. Thank you for the information about how the inability to service your vehicle can endanger not only your life but the lives of others on the road. it’s pleasant to read this blog, and I used to go to see this blog daily. Well, periodic car care is important for maintaining the vehicle’s safety and diminishing the auto repair cost. I know during the hectic schedule it becomes more intoxicating to make the necessary arrangements for car aftercare. Anyway, there can be momentous impediments, if the automobile is not being serviced as per the factory maintenance schedules. Besides that, an unsystematic auto care regimen allows the minor issues to grow and become expensive hassles. That’s why the regular car service should be the top priority of every motorist. The inspection must be done thoroughly and timely with the help of a dexterous auto professional to allow the speedster is run as flat as a pancake and fuel-efficiently.